I remember when this movie first came to video. I knew next to nothing about it, other than the obvious that came about when you watch the movie. I mean seriously, I didn’t know that this movie was a remake for an older one. That’s odd, right? Cause we all know that most of what is coming out of the movie studios now is a remake of some sort. There are times I wonder if we will know what to do with our selves if we are ever given something new to ponder again. This could be the old man in me coming out (get off my lawn you damn kids). Anyway, both movies tell a story of a grim future. They have similar characters and a vaguely similar storyline. The similarity in storyline rolls into the idea of a race with lots of violence with something special going to the winner of said race. And that is just about where the connections between the two ends. Sorta… maybe… I am going to talk less about the movies themselves than I will be talking about the presentations of the stories. See, in the original Death Race (Death Race 2000, 1975) the story plays out more as a dark comedy with over the top violence. And the thing of it is, the plot in the story is incredibly, almost not even present. Because the plot of the story is irrelevant to how we view this particular story. Everything is so over the top that it is the comedic value of the deaths within the storyline that carry the whole thing. The basic concept is a race across country collecting points by killing pedestrians. That concept has become a running gag within our culture and it may have started here or maybe the movie itself is just playing out the gag that has always been there. Through the story we have a satire of our own cold inhumanity toward the world around us. 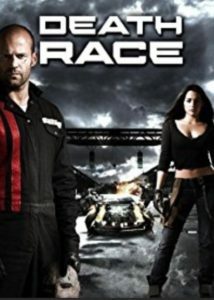 When they made the remake (Death Race 2008), we lost the comedic value of the dystopian future. Instead of people freely running over pedestrians we now have criminals fighting for their freedom in a closed race track. The officials control their weapon use and they are simply trying to kill each other. The feel of the movie leans toward a stronger plot which in turn makes it feel a bit more realistic than the original. The people in the story are working toward real goals. It became an action movie without the over the top comedic element. Now if you are like me, you might notice the irony within this transformation. In the Hollywood quest for remakes, quite often they take something from the 70s that had been intended as something serious, and they flip it into a campy comedy that relies on base line laughs to hold it up. You may notice that when they do this, the resulting story isn’t worth the time of watching it, let alone shelling out 40 bucks or more for a night at the movie theater (hypothetically, mainly because that $40 is the minimum to pay just for popcorn and pop, never mind the cost of the tickets to see the show). This is a time when I think they really blew it. As much as I liked the remake of this film, I dare say that the original was a much better film. The fact that it achieved cult status is a testament to the power of the original storyline. The movie doesn’t play at anything other than what it is. Maybe I am a bit demented but there were a number of deaths within the story that gave me a full-on belly laugh. The shock value alone pulled it all together. 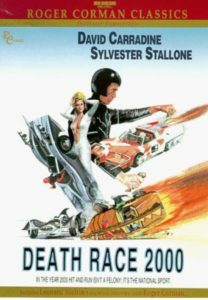 Of course, I have Death Race 2050 sitting on a queue waiting for me to take some time with it. This is a another remake of the original. So we have more confusion to deal with in how we interpret the film in general. When you add in all the other offshoots and copycat films it can be a smorgasbord of fun violence and gruesome deaths. When it is all said and done though, watch the original. Even with the 70s vibe, it is a great film and worth your time. From there it’s just a jump to the left into all the other off-shoots to explore.